Turnitin have introduced a new “dynamic” status page which gives real-time information on the health of their systems. It also outlines any planned downtime. Be sure to check the Turnitin UK section (and not the general Turnitin area). not affect the submission of papers via WebLearn. WebLearn will queue any submissions and will dispatch them to Turnitin once the service is restored. will affect the viewing of originality scores and originality reports – neither of these facilities will be available until the service is restored. 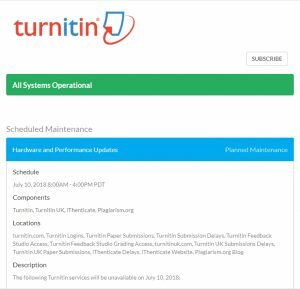 Outage of TurnitinUK will affect both the submission of papers and the viewing of reports and scores. These facilities will only be available once the service is restored.